What are the requirments of a new sign up! 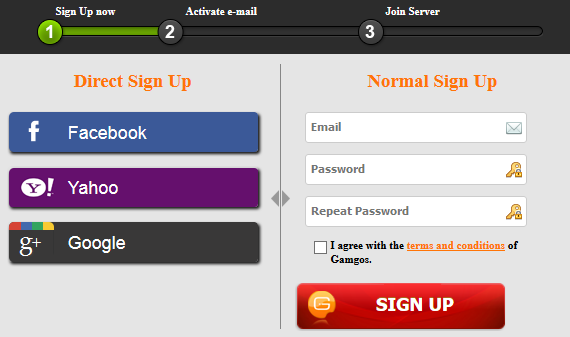 1.1- Sign up now: by entering the email, password and agree on TaC of Gamgos. Note: You must use your real email in order to be able activate your account and join games servers. Players with their Facebooks, Yahoo and Google accounts can register and get started more easily because they do not need to activate their accounts hereafter. To be able to join servers and play, you must activate your account. After registrating in the portal, you will receive an activation message in your email. you can check your inbox and open the message which contains the activation link. just click on this link and get started. Hope you have a good time after joining our game.